This classic recipe for Crunchy Date Rounds makes a perfect lunch box treat or travel cookie. Chopped dates, or raisins if you prefer, add a natural sweetness and the crushed cereal flakes provide the crunch - a perfect combination. A little bit on the history of dates. Dates have been grown and harvested since ancient times and it is believed they originated around the Persian Gulf. Some evidence traces them as far back as 4000 BCE! Date wine was made by the Ancient Egyptians and the little fruit eventually made its way to northern Africa, Italy, Spain, and most recently into Mexico and California by the Portuguese and Spanish Conquistadors around the year 1765. Dates are mentioned numerous times throughout the Bible and are very important crops for the countries of north Africa, as well as Iraq, Turkey, the Arabian Peninsula. Some of the top date-producing countries today include Egypt, Iran, Saudi Arabia, Pakistan, United Arab Emirates, Algeria, Iraq, Sudan, Oman, Libya, Tunisia and China. It can take date palms anywhere from 4 to 8 years to bear fruit after they have been planted. Medjool dates are one of the most popular dates in the U.S. and they are grown in southern Florida, Arizona and California. Now that you know a little more about the history of dates, on to our easy cookie recipe. Preheat oven to 375F degrees. Lightly grease cookie sheets or line them with parchment. In a large bowl, beat together shortening, butter, granulated sugar, brown sugar, egg and vanilla until light and fluffy. Add flour, baking soda and salt, beating thoroughly until well blended. Stir in walnut and dates, or raisins. 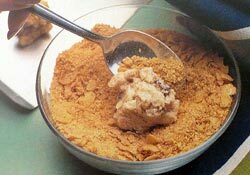 Drop dough by teaspoonfuls into crushed cereal and roll to coat completely. 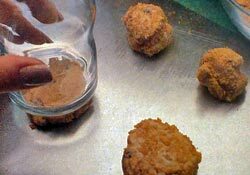 Place 2 inches apart on prepared baking sheets, flattening slightly with the bottom of a glass. Bake until golden, about 12 to 13 minutes. This recipe yields about 36 Crunchy Date Rounds.